This node creates a terrain in the form of cone by elevating the terrain from the outside to the center, conically. To add a Cone node, right click in the Graph Editor and select Create Node > Terrain Generation > Cone. Set half angle: Sets the cone according to the height of the central vertex and the angle at the center vertex. Set the Maximum height to define the height of the central vertex. Use the Half angle slider to set the angle between the central vertex and the surface of the cone. In the example below, increasing the slider reduces the between the central vertex and the surface of the cone. 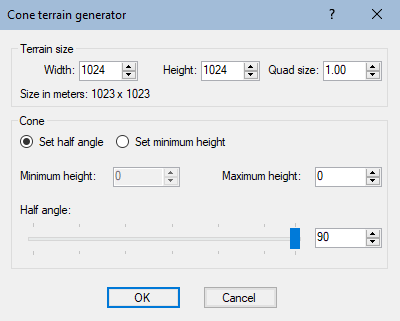 Set minimum height: Sets the cone according to the heights of the central vertex and of the summits of the terrain. The Minimum height determines the height of the four angle vertices of the terrain. The Maximum height determines the height of the central vertex. Set minimum height Defines the cone according to the heights of the central vertex and of the summits of the terrain.